Life is too short to mess with ugly guns and guns I don't like. Had a few I wish I had never sold. Maybe it's an age thing, I expect too much. I want the gun to feed consistantly and I want to punch a hole all the through. Fired through 1/2" pine boards ... it just plugged up .. and it was a +P load. The pharmacist who works for me had 45acp hp’s during the attempted robbery of my store. Point blank and the first shot was a complete pass through in the upper chest and with the exception of rifling, it looked like I could have reloaded it. The second shot hit his gun and blew up, the third went through the abdomen and was stopped by his coat and lying on the floor. It didn’t expand and the tip was just slightly deformed on one side. I got him and myself the hornady critical defense and critical duty in all the calibers we carry now. I haven’t heard anything bad about these yet. 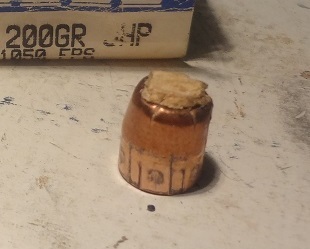 self defense bullets a lot of folks declare them to be. In your case they did exactly what I would have bet on. I've got a very small Kahr in 9mm. Ugly but very concealable and more powerful than the 380.